Zion Williamson was confident during the final minutes of Duke's thrilling win over UCF on Sunday. The Blue Devils trailed by three with 14 seconds left. But, Williamson converted a layup and fellow freshman RJ Barrett corralled his missed free throw and finished a put-back, which gave his team a one-point advantage. 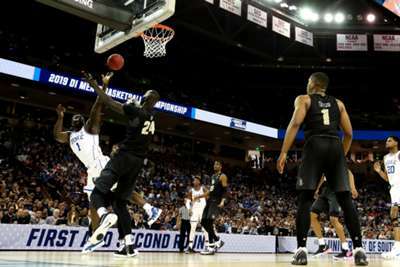 Duke eventually pulled out the 77-76 win when a pair of UCF attempts in the closing moments rolled off the rim. Williamson said he received encouragement from Blue Devils coach Mike Krzyzewski during a break in the action late in the second half. "It's March Madness. A lot is going through my mind," Williamson told a news conference. "I consider [Krzyzewski] the greatest coach of all time. When he looks at you and says 'you're made for this moment' it's like the most confidence you can be giving. When I went to the basket, I knew it was going in." Williamson entered the game shooting 32.1 per cent from three-point range this season. The projected top choice in the 2019 draft, however, hit three of his seven attempts from behind the arc against the Knights. "I always feel comfortable with my three-point game," Williamson said. "My team-mates and my coaches are always telling me to shoot a strong shot. And they trust me to shoot … I was just shooting it with confidence." Krzyzewski praised both Williamson and Barrett after the game. "They hung in there because just the momentum of the tournament, what's going on, you can be defeated right there. Instead, they hung in there," Krzyzewski said. "The will to win of Zion and RJ, you can't measure it. It's just there. "Look, we're a young group, but what they did, right at the end of the game, in willing us to win, was absolutely sensational." Williamson spent parts of the game matched up with UCF big man Tacko Fall. The center tallied 15 points, six rebounds and three blocks in the losing effort. "He played great," Williamson said about Fall. "Hats off to him. He played an amazing game. But, I think we just hit some big shots and we were able to get the win." Williamson is averaging 22.2 points and 8.7 rebounds while shooting 69.6 per cent from the field in 2018-19.